Green MLM Opportunities – Essante & Miessence Reviewed! Hi. Being organic for over 2 decades, I am passionate about sharing pure, potent and truly green products. I also need to earn a living. Maybe you do to? Perhaps you have tossed out all the bad toxic skincare in your makeup bag and decided to go green and need a safe place to shop. Today’s topic will center on 2 great MLM opportunities, both as a shopping experience and as an Independent Consultant looking to make a living. The average person applies between 120 and 200 toxic industrial chemicals before 9am. The goal in representing these lines is to offer least toxic alternatives to a varied client base. Everyone is in a different place with what they like to use. Repping for these lines has allowed me to test a lot of products and share my findings from my own research. I currently rep for all 3 lines. Each one offers a few different products that the other doesn’t and each has their own pluses and drawbacks. 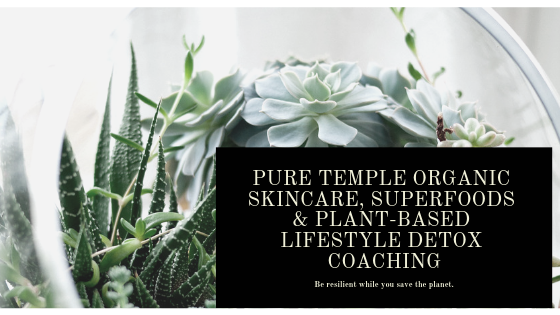 What I like with supporting these three is that this allows me to work with a client and completely tailor my product suggestions to their budget and personal tastes while assuring that what I am offering is less toxic, potent, more pure and effective. For those of you interested in building a business, I work this angle too, because I rep for these lines with the intent on making a living at it. Most of us work at something to create a living that supports our lifestyle. 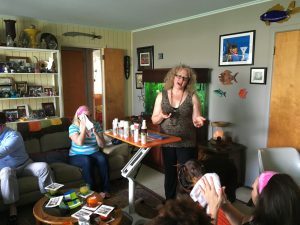 What I love about doing this blog is bringing you ways to become healthier, happier and more centered, helping your creature features (the odd adorable fur children occupying a place in your life) via my PurePet articles and for those curious, business opportunities as well. For those curious about beginning a blog business, kindly direct your gaze to my ‘Getting Started’ page. My quest firstly was to detox my own skin, body and home care routines. When I realized how bad most products actually were, my quest became about sharing what I know. Taking a year off work and training with Hippocrates Health Institute was a 360 for my life. This training came on the heels of just having lost my mother and a brother to cancer, and hearing the sad news that I had other family members terminal with the disease. I felt led with a stronger resolve to share out my detoxing message to as many folks as I can. With my Plant-Based Lifestyle coaching, I began looking at products I could talk about and feel great about sharing. Most of us want to look our best and feel our best. The philosophy here is inside out and outside in whole health. Even someone who is on the ultimate raw, sprout filled, green juice imbibing plant-based diet will have holes in their nutrition. This is because our planet is so polluted, our soil so eroded, that we both lack and require more than what the best diet can provide. And it may sound crazy, but you would be just amazed at how many clients I talk to who are vegan, watch what they put into their body, but haven’t really given a great thought about their skincare or home cleaning agents. Because the body absorbs at least 70% of what is applied topically, what we come in skin contact with, what we clean with, use as deodorant, colognes and moisturizers matter…a lot. Supplements – ONLY 9% of Vitamins on the market are good. The rest contain motor oil, coal tar, turpentine, petrochemicals, talcum powder (a carcinogen) and are very unhealthy! PRODUCT LINEUP – This company is coconut water based with a focus on organic and wild-crafted ingredients. This line has just launched a clean mascara and eyeliner pencil. They have a yummy lemonade tasting selection of lip tints/glosses that aren’t sticky. They have a good anti-aging firming trio for skincare as well as a rejuvenating skin cream I use twice a day, that helps with dark spots and other sun damage, a non-tinted lip balm and an oh my lord good body butter. There’s a nice face wash, toothpaste options, hair care, laundry soap, sanitizer that is no fragrance, stabilized oxygen that kills off 98% of any germs on contact. You can spray this on cuts, in the locker room (there’s a purse size too) or use on the kitchen counter as we do because we cannot keep our kittehs off the counter! Oh, a great natural bug repellent, yummo superfood & other supplementation and organic therapeutic grade essential oils. THE GREEN- Essante is a mix of certified organic and wildcrafted. Unlike Miessence (rated below) it is not 100% organic meaning they rely upon growers for most ingredients. Essante also gets a lot of great wild-crafted meaning there is no pesticides and the produce has been raised in the wild with great soils. Prices on their superfoods reflect this. The brand uses Greenpeace Award Winning Organic Palm Oil. They are non-GMO and cruelty free. TOXINS – The brand states they are ‘Certified Toxic Free’. Looking at a few of my favorite products – Essante NaPCA Calming Toner Mist & Z3 Holywood’s Anti-Aging items – Um…not really seeing any science here, no chemicals stand out for me. CLEAN VERDICT – Really clean product, with certified organic and wild-crafted green ingredients you can rely upon to be pure and effective. PRODUCT LINE UP – Great SuperFoods powders (green, alkalizing, probiotic) Their reds has dark cacao in it and is delicious! I also get their fulvic acids monthly, this is a primordial ancient soil mineral complex really hard to find. There’s a nice enzymatic house cleaner and some very nice skin and body care. As with Essante, these products are some of the best I have used. I adore their Eye and Neck Firming Serum and won’t be without their hand cream or Rejuvenating Skin Conditioner, which is perfectly light and penetrating in the heat of Texas when you need moisture but not a ton of creams on your face, neck, and hands. I also love their probiotic toner! SIGNING UP! – Signing up is easy but to gain commissions from sales, you are required to have a monthly spend that adds up to 75 ‘points’ which is about 100+ per month. The products are fabulous and I get a mix of their super greens and fulvic acids so it’s easy to meet the monthly requirement. HOW YOU ARE PAID – This is an Australian company so when you request payment, there are conversions to your currency such as from Aussie to US currency. Australian transfers can take up to 4 business days to clear funds into your bank account. International transfers can take up to 7 business days to clear funds. Due to this, I prefer to buy products in bulk and then retail it myself or if you own a shop this a perfect for that scenario. You may also direct folks to purchase directly online. THE GREEN- The company is carbon negative. Miessence is also ACO and USDA Certified Organic. TOXINS – You can basically eat this stuff. It is all 100% food-based, from skin care to body care to supplements. Getting back on the topic of supplementation, Alkalizing is huge. So is Hydration and Detoxification. Hippocrates, the Father of Medicine, recommended over 2000 years ago, “Let food be thy medicine, thy medicine shall be thy food.” Most folks are not juicing and dining on a plant-based diet and need a lot of supplementation. In fact, anyone who is ‘eating perfectly’ in this polluted world still needs supplementation. Hippocrates Health Institute is huge on juicing. 80% of Americans are chronically dehydrated. One of the large benefits of juicing is in the hydration. Of course, when you dehydrate your ‘juice’ into a powder, you lose out on that hydrating effect, but you at least get some of the nutritional benefits. And, as you add those benefits back into a drink/smoothie then you are adding some hydration there as well. It’s always going to be better to control your food, buy fresh organic produce and make your own green juices at home but then there is work, travel and time constraints that most of us have. Scrubbing the body helps you detox through the largest organ of the body; your skin. You take in vitamin D from the sun and absorb what you put on your skin. When you sweat, you eschew toxins and cleans the body. Dry brushing is terrific before the bath to prep the skin (as well as hit hard to reach spots on the back for example). I did some serious sun damage so I have been doing peels and scrubs for 20 years now. Because organic and natural safe non toxic products are a big biological impact, you will only see things of that nature here. DRY BRUSHING – Helps flush the skin, bring new blood to the surface and is perfect right before a nice detoxing soak. This brush, the Bemodst Dry Skin Body Brush, is the same that I use at home, with natural wood and bristles that feel nice and tingly on the skin. It comes with a handle to reach the back and is a terrific price. After your dry brushing, you are ready for the next step, scrubbing on damp skin. Darling Salt Glow is an eco-conscious body scrub made from environment-saving salt sourced from the troubled Murray-Darling Basin in Australia. Before you say you don’t care, remember, we are all one, all connected. 🙂 Blended with deeply moisturizing coconut oil, clove and citrus, it’s especially perfect for fall and winter time when you want to feel a bit more nurtured and toasty. You can get the Darling Salt Glow in a nice 3 pack for $124.00, but there are also discounts applied (and free shipping) based upon your spend level. You can see that prior to solidifying your check out and make any changes. The line has very good tinted moisturizers with SPF and mascara as well as other stuff I use daily but that is another topic. First up from Amazon (I adore Amazon, you can buy almost anything) is First Botany Arabica Coffee Scrub which not only has that cup o joe wake me up delightfully aroma, but has been voted ‘Best Acne, Anti Cellulite and Stretch Mark treatment, Spider Vein Therapy for Varicose Veins & Eczema’ and I have no argument for all that. If you are more of a cacao person, next up is the ever delightful Giovanni Hot Chocolate Sugar Scrub, which is divine. Slightly warming and the aroma is intoxicating for those of us who crave dark chocolate. You can click on the coloured ink to get shopping. I selected the 5 pack but you could buy just one. The 5 pack is a great price and trust, you will use this stuff up fast…because it is that great. While I type this, I actually have it on my desk huffing it. Maybe I have a problem. No, this stuff just rocks. Next, also from Giovanni, is the Giovanni Cool Mint Lemonade which is a salt scrub that is equally intoxicating. It is aromatherapy with the scent filling the shower. I live in Dallas, and it gets bloody hot but mainly hot and humid here. I use this in bulk in the summers. So in other words, all year round. It’s perfect after gardening, getting stuck in traffic, whenever you need a serious chill. In fact, this stuff is so chilling, I have even had to add hot water into my tub. Impressively cooling. I have this product on autoship. Greenscape Salt Scrub (In any of their scents) gets high marks for both scent and a larger (19.4 oz) size. The link above gets you Rose and this one here is Greenscape Lavender. So with the holidays coming, and with most of us planning to imbibe a wee bit, this is the perfect time to stock up on scrubs to get you glowing! Lip Balm – Are ingredients Important? These are the products I endorse and sell. Click on the link above to take you to the site to order from. polluted, and that’s before we pour the next martini. It is important that we consciously clean our bodies out on a daily basis. • Even though you may put the best nutrition in your body it can’t function as it was designed to function, unless you’re also removing toxins from your body. • To underscore with urgency, consider the fact that young people and even children are now getting diseases like Crohn’s, colitis, diabetes and cancer sooner than ever before in history. The painful truth is that the money machine is not set up to protect us. The government doesn’t protect us. Big pharma and Big business mostly is after our wallet and they don’t typically care about the environment, the planet or toxins unless they are an all organic green company. In my Hippocrates training recently I learned that after the wartime in the 50’s companies had created toxic chemicals to kill our adversary that was later used on our crops to kill bugs. And we didn’t even realize then what the substances actually did, how they really worked! All this stated, we know men are mostly wash and wear while most women apply at least 8 different products on their face every morning. But either way you go, we all have skin in the game. Yeah, I couldn’t really resist saying that. We must all be mindful of what we apply on and in our bodies. Everything we apply topically sinks into our body. Just seeing a pain patch do its magic is eye opening as to exactly how swiftly the product is absorbed directly into the bloodstream. Everybody is busy and just trying to get through another hectic day as swiftly as they can, right? This is why I post this stuff, to help us all avoid toxins while learning what we all can do, to live a greener and cleaner (and far healthier) life. Avoid anything with ‘eth’ in the name, such as Sodium Laureth Sulphate, ceteareth or oleth. Propylene Glycol, the main ingredient in antifreeze, is even in food and is especially prolific in cosmetic and skincare! Avoid it is you see the words PEG or Polyethylene glycol, DEA, TEA Lauryl Sulfate, MEA, Pareabens, Formaldehyde, Triclosan. And things can get tricky when stuff sounds natural, sounds pleasant and nice but isn’t, such as Japanese Honeysuckle Extract or what about fragrance? That doesn’t sound bad but yes, that is too. Just the word ‘fragrance’ can really mean that up to 400 separate ingredients (and chemicals) went into that product. This can include toluene, phthalates, which can cause liver and kidney damage, harm a fetus, and disrupt the endocrine system amongst other things. Buy products that state they are certified organic from companies you know and trust. On that topic, know that one of the best things sbout Miessence, other than the fact it is a carbon neutral company that has gone through the necessary steps to be certified 100% food grade organic with no chemicals, is that the products are made fresh from the factory and shipped directly to you. Unless you are very motivated to make your own skincare products in your kitchen, this is one of the rare lines where you can get the absolute freshest most pure and potent product for your gorgeous skin! 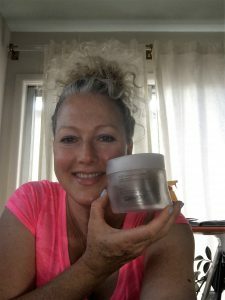 Miessence Organic Skincare & Business Opportunity! Hi. After 26 years as a Project Manager in Telecommunications, I am now an independent rep and proudly sell Miessence Organic Skincare. Skin is our largest organ, a living breathing example of our shining health…or issues on display. But what many don’t yet know is that at least 60% of what you apply on it, be it natural or chemical, absorbs right in! With chemicals and hormone disruptors everywhere we look, it becomes critical that we be mindful not only what goes into the body to nourish us, but also what we apply on top of it to cleans, tone and moisturize or block the UVA/UVB rays of the sun. 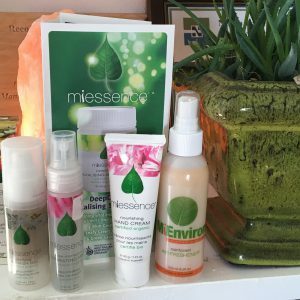 Miessence offers great bio-available tonics, enzymatic house hold cleaning products, deodorant and heavenly body/skincare products. I love the smell, that fresh plant based aroma in every product I use. You can of course go to my website and shop to try and enjoy the health and beautifying products but you can also join, its free, and on two levels; one to just get a discount yourself to buy the products or to buy the products for yourself and also promote them as I do. We all must be more mindful of of the planet we share and how we can personally have a positive impact. The way we live today isnt sustainable. I am trying to change the world by how I shop, what I do and don’t buy. Recently someone told me how the world will never change but think of the power in our spending! Corporations rise, operate or fail by what we buy. Spending is an ultimate power. We make this choice daily, each time we buy only local organic produce, buy only organic humanely raised meats and eggs, etc. THIS hit my inbox earlier, for MAC Cosmetics among others. And THIS is exactly why I rep for miessence (https://www.miessence.com/puretemple/en/category/1/skincare). 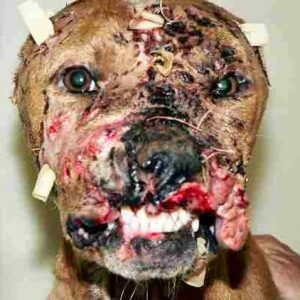 By the way, MAC states that while they do not do inhouse animal testing, they do so in China, for example. When a company uses chemicals in their products, there are mandates for testing. I have TWO primary objectives for becoming an Independent Rep for Miessence. Firstly I believe all the chemicals, toxins, hormone disruptors and anti-freeze (propylene glycol) that is in most skincare, home care and, sadly, in much of our processed foods, are unnecessary, cause cancer, early puberty among a host of other drama. I firmly believe they contribute enormously to our body burden of toxins, are an awaiting stew of illness waiting to explode within each of us, causing us to die off far sooner and more painfully than we ever should. And the 2nd reason is for such piteous pictures as the one here. In the last couple of months, I must have signed hundreds of petitions on animal well being. These poor cats don’t use cosmetics and yet are held down forcefully to have chemicals that are bad for them applied to them. Let’s be honest, if we need to test a product on an animal other than ourselves, something is gravely wrong with that product to begin with! I encourage you to vote with your wallet and buy from reputable, sustainable and health giving companies. Miessence is carbon negative, food grade, 100% organic with no chemicals or animal testing ever! The products are great. Rather than shopping a nice department store where products may have sat for however long on their shelf, these products are made in batches and shipped at order! Other than concocting serums in your own kitchen, which is really a groovy thought but most of us aren’t chemists and don’t have that kind of time or fridge space, this is one of the very best ways to get truly pure and potent, fresh skin and body care, as well as some great cosmetics. Their foundation is very nice and has a natural sunblock in it that holds up well in Dallas TX swelter. 🙂 Miessence has a great mascara, some lip colour and everything else is about caring for the skin and body (or home). I use their alkalizing body tonic in my daily smoothie when I am not growing a batch of wheat grass. I love the smell of their Biopure Probiotic Household Concentrate. You add it to water for cleaning. It has a yummy vanilla scent and I use it with my floor steamer in the water rather than vinegar. My sister in law will not be without the Face and Neck Serum, which has eliminated her ‘Crows Nest’ as she calls it. Anything that comes straight to your door saves time, but getting the products super fast is a joy. Sure, I could definitely use the cash, but the reason I rep for Miessence is that it is in line with my ethics. Let’s save animals, one cat and one lipstick at a time!